Add a touch of sparkle to your home bar and never lose track of your drink again. 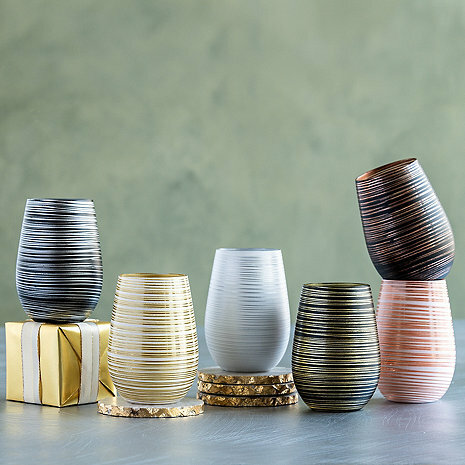 Set of six unique earth tone colored tumblers with hand painted metallic spiral design. No need for wine charms! Are they dish washer safe? BEST ANSWER: Hand washing is recommended. Are they glass with metalic paint or metal glasses? BEST ANSWER: They are glass with metallic paint. I’m very happy with mine! They are hand painted with some metallic paint included. They are glass with metallic paint. Very beautiful! The tumblers are each unique works of art. A must have for anyone who appreciates a very unique wine glass. The wine tumblers are festive & properly sized for the spontaneous occasion. They hold securely & comfortable to drink from. Many compliments received! !